Hi all! Yay for Friday! I wanted to share this card I made using the newly released TAWS set called Slurp. It's super fun with awesome images and how true is this sentiment??? ;) I colored the image with Copics then fussy cut it. The sentiment is embossed with white EP. So I hope y'all aren't tired of seeing watercoloring! It is EVERYWHERE these days and if you haven't tried it, I highly recommend that you do! It is SO FUN and there is NO wrong way and you get different results almost every time. This time I took 4 different distress ink pads and stamped them directly onto my craft mat, leaving a little space in between colors. Then I spritzed them with water, being careful to not have them blend too much (leaving the space between them helps with this). Then I took smooth white card stock (nope, NOT watercolor paper!) and smooshed it onto the inky spots. I carefully pressed around the back of the card stock which helps the ink/water to spread. Lifted the card stock and voila! A little blast with your heat gun and done! I decided to break up the panel so I took an element from Blueprints 9 and cut out strips. After that, I adhered them to a layer of pool party card stock. A little silver cording and a few gumdrops finish up the details. Those watercolors are SO pretty. Nice job! I couldn't agree more. Great card! Such a beautiful mix of colours for the background and love the strips across. Gorgeous!! Lovely background watercolor! Great transitions. Love these strips of color. You're right...........eat dessert first. Beautiful card. This is just soo pretty!!!! I like how you used the stitched borders. And the colors are great! 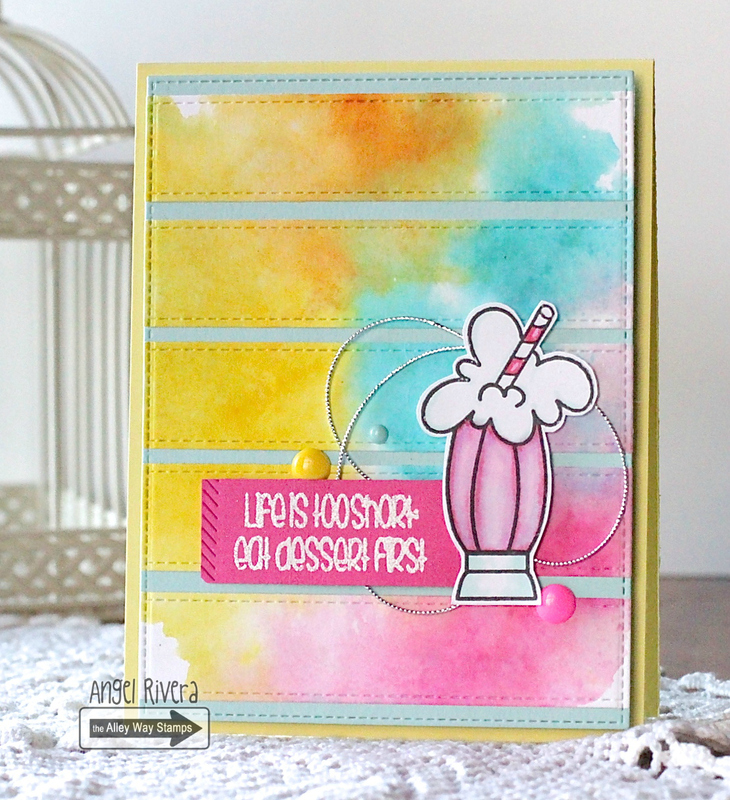 Love, love the bright happy colors!! Lovely! Love the smooshing technique and the colors you chose! Cute sentiment, too! So beautiful! I love how you did the background!! Totally adorable!! 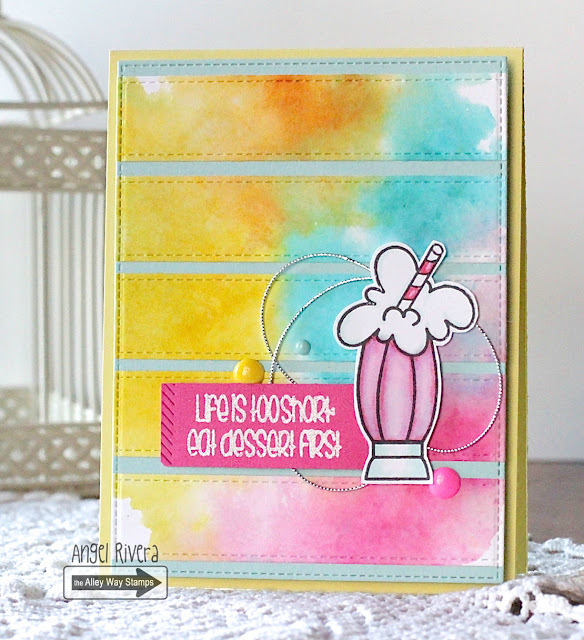 Love the colors, the fun dies you used and that sentiment. Really beautiful card.